Linda Gamblin (second from left) with PPY students Austin, Charlotte and Eugenie. Photo by Elizabeth Ashley. Since 2014, Sydney Dance Company (SDC)’s Pre-Professional Year (PPY) continues SDC’s commitment to training young dancers, continuing the strategy that Rafael Bonachela initiated when first taking the reins of the SDC. Bonachela continually seeks to deepen the experience of the company, heading toward an evolving future rather than relying on past achievements. 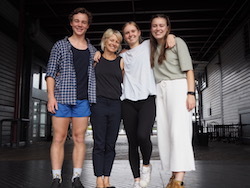 After their first seven weeks in the SDC Wharf studios, we had the opportunity to speak to three of the 2018 PPY students – Austin, Charlotte and Eugenie, a wonderfully mixed bag of talent, personality and background. Course Director Linda Gamblin played an integral part in the initial conception and inaugural PPY in 2014, and is still there playing and enjoying her pivotal role in the program. 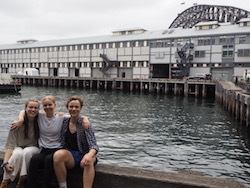 PPY students Eugenie, Charlotte and Austin outside the Sydney Dance Company studios. Photo by Elizabeth Ashley. Continuing to work alongside Bonachela, Gamblin ensures the relevance and validity of the program, which leads to a Nationally Accredited Diploma of Dance (Elite Performance)*. Below, get to know those three PPY students and what the program means to them. Eugenie: Originally from Geelong, Eugenie spent a year with Yellow Wheel, a contemporary youth company, trying to find the path she wanted to follow. There’s a lot of work in the schedule, so it is kept relatively flexible. The students are constantly learning different movement styles from a range of industry and professional specialists such as Narelle Benjamin and Martin del Amo, just to name a few. “They give us their philosophy on movement, on the tendu, on life, and we learn from it,” Charlotte says. At the moment, the PPY students are learning from a movement philosopher working with Qi Gong. Later in the program, they’ll start doing choreographic development, which can be either for graduation, or choreographic development for the sake of development. What are they all looking forward to? And for these three young dancers, what is contemporary dance? Stay tuned for further updates on the dancers as we follow their journey through to graduation. 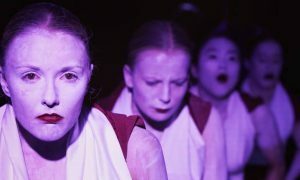 For more information on Sydney Dance Company’s Pre-Professional Year, visit www.sydneydancecompany.com/classes-and-courses/ppy. *CUA50113 Diploma of Dance (Elite Performance) and CUA60113 Advanced Diploma of Dance (Elite Performance) are delivered through an auspicing arrangement with Australian Teachers Of Dancing Limited (ATOD) Registered Training Organisation #31624.